Whoops, I originally thought this was the Another APA. 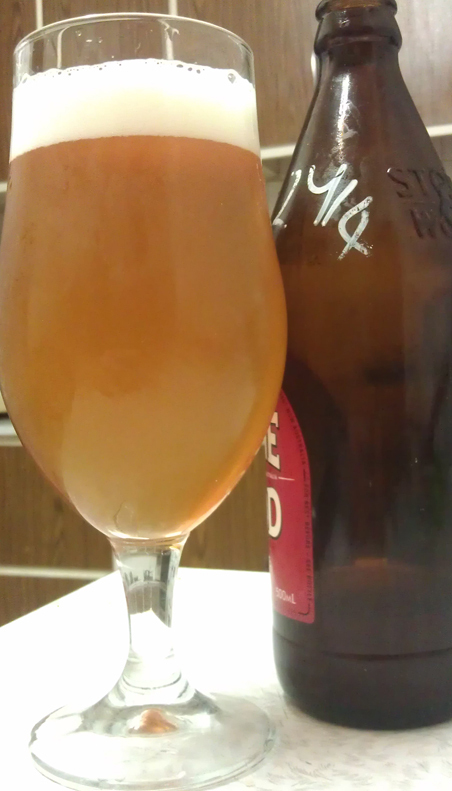 I’ve recently found out this was actually the ESB 2014. Review updated to reflect that. My good mate Ian made few brews earlier this year that he wasn’t so happy with. Then in March he made some more beers that he was happy with. The second one that I’ve tried is the ESB 2014. Really nice tropical smell to this beer. Hints of pineapple with nice floral sweetness. Smooth up front. Sweet and rounded. Good fruit salad tastes. Bitterness isn’t that strong as the hops are more about the fruit and wood flavours. Malt is a light pale and helps support the malt. Sort of caramel hints. Very easy drinking. This is a very good beer. I’ve liked it from the start. As it’s warmed up it became softer and smoother, making it even easier to drink. Not sure if I’d call this an ESB as there’s a lot of fruit and isn’t that bitter. That said once warmed up it is a lot closer. Food matching, I would say some kind of lightly grilled or barbecued meat. Something like lamb with herbs. The sweetness of the lamb would match the soft sweet flavours of the beer. Good beer. Ian, make more of this.